“We have been a customer of Denta-Gard for many years and have been using the Denta-Gard mouthguards for our patients for over ten years. We have found the quality and versatility of this product to be outstanding. “We have used the Denta-Gard mouth guards in our orthodontic practice for several years. The mouth guard forms to all size mouths and is easily “trimmed” smaller if needed. “I would like to take this moment to thank you for the years of good service supplying our office with your product, Denta-Gard mouth guards. We have been using them for many years now, and have been happy with the product. 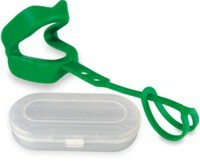 Your mouth guards are given to every patient that gets braces in our offices. We want all of our patients to wear mouth guards for any contact activity. We invite you to browse our website to learn more about the Denta-Gard® Mouthguard. The mouth guard recommended by Orthodontists. Be sure to watch our Denta-Gard product demonstration video on our home page.